A Woodsrunner's Diary: Quotes on the Editor of this blog, and author of "Primitive Fire Lighting"
One of the foremost specialists in historical fire-making is re-enactment and Living History expert Keith Burgess, whose little book on the subject I have found most enlightening. Keith’s blog can be found here. there is a tag going around the bushcraft channels on YouTube where people who like to make bushcraft videos are promoting each others channels as a support and inspiration to each other. I know that your channel is not that type of bushcraft oriented channel, but I mentioned you in it it anayway, since I like what you do. Very good book. just finished it this weekend. easy reading. easy to understand. I thought it was well worth da money. I went with da paper version just out of preference and I am glad I got it. keep up da good work. I always liked this video. 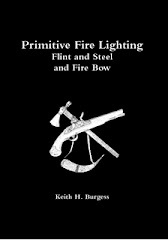 Just finished reading your book on primitive fire lighting, flint and steel and fire bow. Very good book. Even if I can get a fire going I think I learned quite a bit from it. Also nice to refresh da memory on some things as well. Very good book. Just finished it this weekend. Easy reading. Easy to understand. I thought it was well worth the money. I went with the paper version just out of preference and I﻿ am glad I got it. keep up the good work. you, my friend, amaze me with every video you post..every DVD you make..every thing you present to us. These skills you share are So relevant today. Thank you for sharing your information. You're like an encyclopedia! Thanks Kieth. I see a couple of more DVD's in my future. If they are as good as the others I know that I will be very impressed. Great Job! Very informative and entertaining video, as always. Thank you for your videos, they are good references and full of awesome information. Hello mate, from Vancouver Island British Columbia Canada. Name here is Glen I have commented on a few of your videos they are all outstanding! Your videos are the best I have seen for the time period and on bush craft skills. I enjoy your practical teaching approach very easy to understand and follow. My interest is Bush craft and learning "the forgotten skills of our ancestors" from the 17th 18th and early 19th century. or the fun of bartering instead of using money. Thanks ! Just wanted to let you know, I've learned how to use flint and steel without charcloth by watching your videos.﻿ Thanks for posting. Another great instructional video, Keith. Thank you so much. I always learn something new from you. Thank you so much Keith. I really appreciate it and wish you all the best. I am familiar and watched many of your internet videos. I'm thankful that you do what you do and share it with the world, I've learned a lot from you already and it adds to my quality of life. Yes, we have talked in the past. I've been aware of your page as the best researched source on the web concerning our peculiar activities, and have used it for years. I owe you many thanks for that, as does everyone in the hobby. Tools Of The Trade UPDATE.